I shared an important lesson with my eleven year old daughter earlier this week. It wasn't a "school" lesson, but a life lesson. For E'id, my husband and I gifted her a large handbag to take her books to classes, or just to carry her purse inside when we go out. It is an elegant bag, navy blue: simple so it isn't a form of beautification or adornment. From the minute she saw it, she loved it. We both knew she would. It was made for her, Allahumma baarik laha. A few days ago, she was getting ready for another class, and I asked if she was putting her books in the bag ready. She hesitated, so I asked whats wrong. She told me in class a couple of days earlier, the girls had told her the bag is too grown up. In that second, my heart sank. And I knew in this moment, this event, although pales such insignificance, would actualy have lasting effects for the rest of her life if not dealt with properly. My dear, I will share something with you which has taken me 35 years to learn myself. And if I knew this lesson when I was your age, things may have been very different now. "Who is the only One whose thoughts of us matter?" Allah was her reply. I asked, "do you like the bag?". Of cource she answered yes (she loves that bag!). I continued, "So long as you are doing something which does not displease Allah, do what makes you happy, not anyone else." I told her, the only One whose thoughts about me count is Allah, and then also my husband, and my parents, and my children, and those who truly love me. If I am happy with something, it doesn't matter what anyone else thinks, and in truth no one else really cares what you or I do. 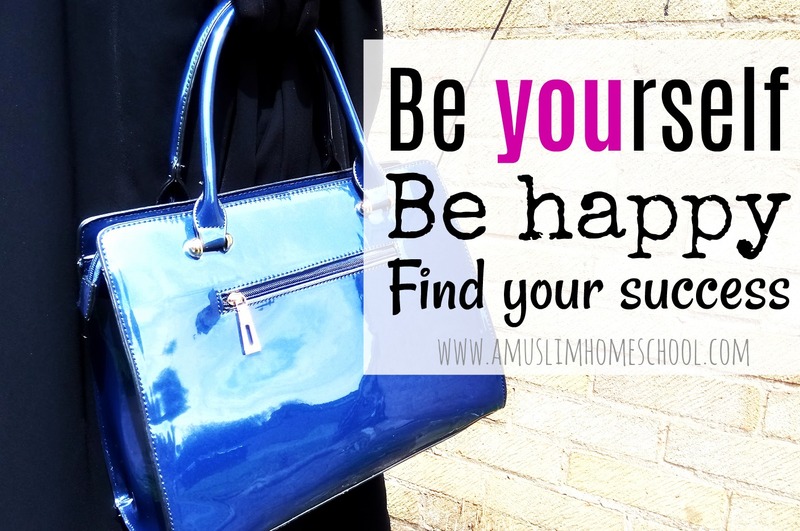 If what we want for our self is not displeasing to Allah, do what makes you content. What makes you happy, and indeed what will give you life long success in both this Dunya as well as the Akhira, is not the same as your friends, just as what makes them happy or gives them success won't be the same for you or I.
I know: I have given other people's thoughts of me far too much precedence from when I was a child myself through to being an adult. I don't want my children to have that same outlook because it is such a false one, but one that so many people live their lives behind; especially girls.....and much to the hindrance of only themselves. The only One who really counts, is Allah. If something does not earn His displeasure, then be yourself. Be you. Be happy. Find your success. Masha Allah tabarakallah, I love this post. Its such an important lesson for our children to learn - to be happy with who they are and not to allow peer pressure to get to them. alhamdulilah.